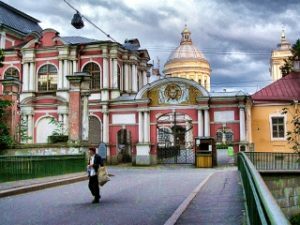 Alexander Nevsky Laurel is one of the oldest monasteries of St. Petersburg. It is the location of the relics of the Saint Prince Alexander Nevsky. The first mention of the monastery dates back to documents from the time of Peter I, when he issued the order to build the Alexander Nevsky monastery on the supposed site of the victory of Prince over the Swedes. Upon the decree of Paul I, the monastery was granted the status of laurel, and in 1909 here was founded the museum – Archive of laurels. Today, the monastery is still active and attracts pilgrims and lovers of art and history, as it’s territory had become a State Museum of Urban Sculpture, founded in 1939 as Russia’s only museum institution, devoted to the study, protection and restoration of monumental art in an open urban environment. The main exhibition of the museum is located in the necropolises of the Alexander Nevsky Monastery. You will see the monument to Alexander Nevsky, the Annunciation Church, the Trinity Cathedral, the Dukhovskaya church and the Church of St. Theodore, St. Nicholas Church and Necropolis. This excursion is not available on Mondays and Thursdays.